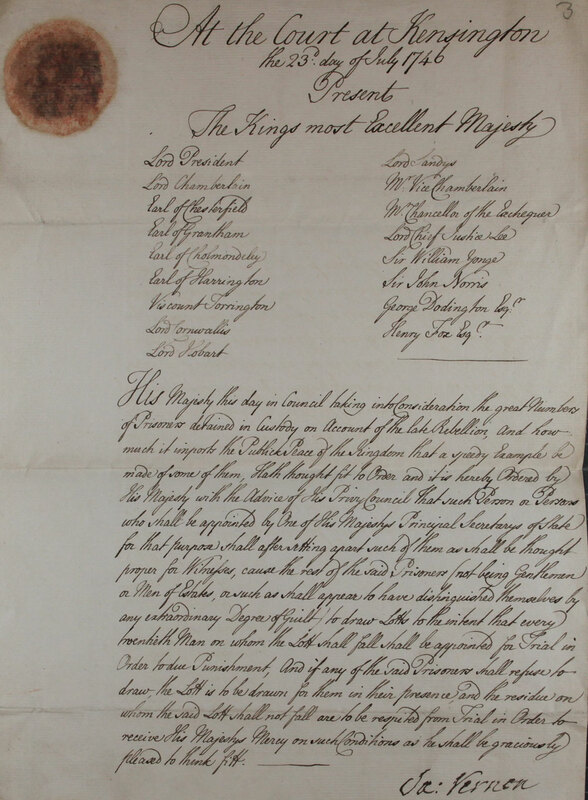 An order on behalf of King George II for the authorities to draw lots to decide which prisoners will face trial as so many prisoners taken were after the 1745 Jacobite rising. The government wished to make examples of them, 23 July 1746 ( TS 20/44). His Majesty this day in Council taking into consideration the great Numbers of Prisoners detained in Custody on Account of the late Rebellion, and how much it imports the Publick Peace of the Kingdom that a speedy Example be made of some of them, Hath thought fit to Order, and it is hereby Ordered by his Majesty with the Advice of His Privy Council that such a Person or Persons who shall be appointed by One of His Majestys Principal Secretarys of State for that purpose shall after setting apart such of them as shall be thought proper for Witnesses, cause the rest of the said Prisoners (not being Gentlemen or Men of Estates or such as shall appear to have distinguished themselves by any extraordinary Degree of Guilt) to draw Lotts, to the intent that every Twentieth Man on whom the Lott shall fall, shall be appointed for Trial in Order to due Punishment, And if any of the said Prisoners shall refuse to Draw, the Lott is to be drawn for them in their presence, and the residue on whom the said Lott shall not fall, are to be respited [spared] from Trial in Order to receive His Majesty’s Mercy, on such Conditions as He shall be graciously pleased to think fit.